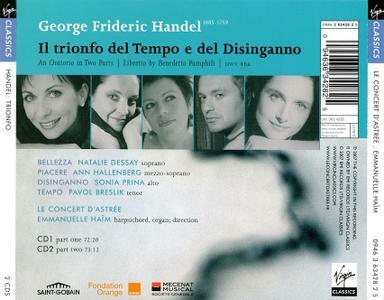 Handel wrote the secular oratorio Il trionfo del Tempo e del Disinganno (The triumph of Time and of Enlightenment) to the text of one of his patrons, Cardinal Benedetto Pamphili, in Rome in 1707. The libretto, which doesn't stand up to close logical scrutiny, centers on Beauty, who must choose between self-indulgent Pleasure and the austerity of allegiance to Time and Enlightenment. Needless to say, any patron entering the theater for the performance, having noted the title on the playbill, would have no doubt about the outcome of the struggle, so dramatic suspense cannot have been one of the inducements for an eighteenth century audience. The rewards, however, are real, most notably Handel's remarkably fertile inventiveness and musical ingenuity, which justified sitting through a two-and-a-half-hour performance that was guaranteed to be a dramatic non-starter. Handel keeps recitatives to a minimum, and the oratorio is rich in musical substance and variety. 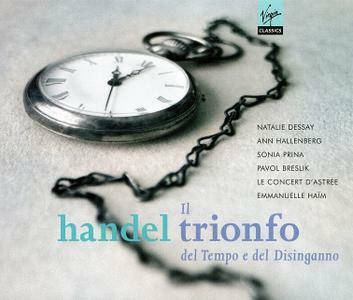 With this CD there's the added attraction of stellar vocal and instrumental performances. Emmanuelle Haïm leads le Concert d'Astrée in a light and sparkling reading, and the energy never lags. Soprano Natalie Dessay as Bellezza is vulnerably delicate, but also has reserves of temperamental strength, and she brings real warmth to the personification. As Piacere, mezzo-soprano Ann Hallenberg is beguilingly tempting, displaying more than a little naughtiness, and she sings with absolute security and ravishing tonal beauty. Alto Sonia Prina, as Disingenno, is a genuine coloratura alto, with dazzling agility as well as a full, pure tone. Pavol Brslik, as Tempo, has a light but focused and pleasing tenor, and he nails the composer's virtuosic demands. Virgin's sound is immaculate, with depth and ideal resonance.